Outstanding Queen Rock Band Tribute show with arguably the best Freddie Mercury Look-alike and Sound-alike working the World Corporate Entertainment Events Industry today. Based Brisbane, Queensland QLD Australia. Imagine a show that features the musical legacy, energy and iconic performances of the English super group QUEEN. 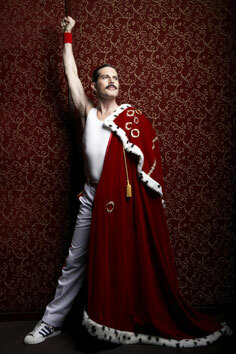 Johnnie Blunt bears an uncanny resemblance to Freddie Mercury. Audience members are often convinced that what they are seeing on stage is Freddie's ghost. The moment he sets foot on stage, Freddie's very essence is alive again. All members of the band in fact bear a very real resemblance to each of the original Queen Rock band members. These guys have performed throughout Australia and Asia also appearing on several Television commercials. You would have most recently seen them featured on TV Channel 9's Australia's Got Talent where the judges gave them very favourable critiques. Nominated at the South East Queensland Entertainment Awards as Best Tribute Show they perform live with no backing tracks all songs kept in the original key of Queen. This exceptional band is available for conference dinners, Gala dinners, Corporate and Association Awards nights, Festivals and Clubs both local and international. Queen Shows can be up to 3 x 45 minutes and can use the venue sound, light and stage production or come fully equipped with it's own laser light and sound production suitable for up to 200 guests in an indoor area. Feel free to ask our agent contact below for more details. Please include in your email what date you would like us to perform, how many guests you are expecting and in which venue/city the function will be held. Thank you. We Will Rock You.